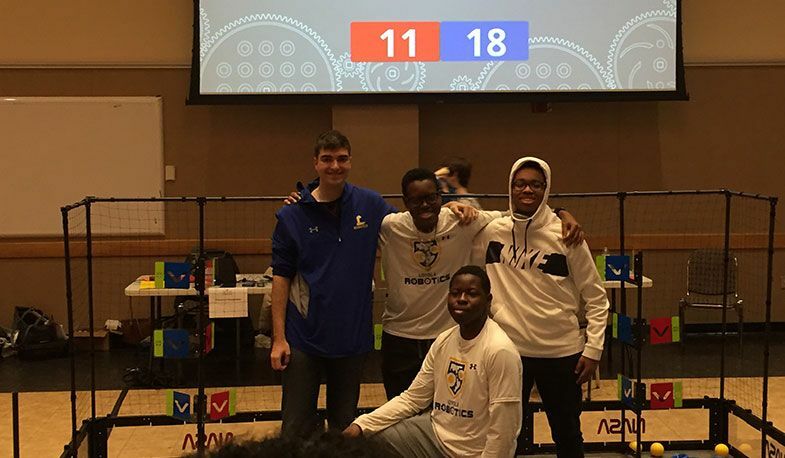 Loyola Blakefield Robotics traveled to the University of Maryland Eastern Shore on February 2 for just their third VEX Robotics competition of the school year after their equipment showed up four months late halfway through January. After only three weeks of preparation, our Dons Blessy Mbaya '19, Harris Kokkinakos '20, Benick Mbaya '21, and Jordan Andrews '21 finished at the top of the heap, taking first place, as well as the Judges Award (based on their adherence to the engineering design principles) and the Sportsmanship Award. Also, NASA served as a sponsor of the event, so the guys were able to interact with NASA engineers and hear about internship and scholarship opportunities. Loyola Robotics had a late start this school year as their equipment showed up four months late, but the boys wasted no time. The final piece of necessary robotics equipment (wireless motors) arrived on Friday, January 18, and the group competed that Sunday at the Baltimore City Robotics Center where they managed to put together two competition-worthy robots in record time. The team of Harris Kokkinakos, Jeremy Hannon '20, and Brendan Reiners '23 even managed to get their robots into the elimination rounds. Six days later, on January 26, they competed at the Calvert Hall Robotics Classic where the team of Harris Kokkinakos and Jeremy Hannon managed to make it to the quarterfinal in a field of 66 teams. It’s safe to say that robotics is back at Blakefield.